The province of Krabi is popular for its distinct nature, boasting the limestone islands of the Andaman Sea, the sacred temples and the white sand beaches along the coastline of Andaman. While these attractions remain the major scenery of Krabi, there are plenty of worth-experiencing sights that are easily accessible for daytrips and one is the Crystal Lagoon in Khlong Thom, Krabi. Besides the recommended tours, which include the Tiger Temple and national parks, another great gift from nature that every tourist wants to experience when getting to Krabi is the Crystal Lagoon (Crystal Pool, Emerald Pool). Due to nearby volcanic activity, hot springs are formed that offer a rejuvenating plunge with its warm, turquoise spring water bordered by mangrove forests. 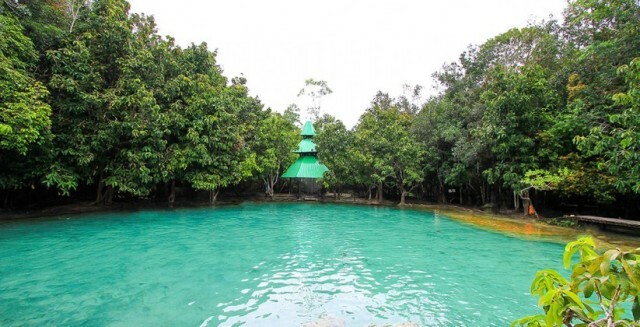 Also known as Sra Morakot in Thai, the pool is made of naturally-formed rocks at the heart of the forest and an ideal stopover for lunch when wandering onto other nearby sites. Travel time isn’t too long: it only takes 30 minutes’ ride using motorbike or songtaews to south of Krabi, going towards Koh Lanta. If you want to be adventurous and want to get there by yourself, start from Highway No.4, reaching Nua Klong then heading to Khlong Thom District; turn left to Route 4038 until you reach Lam Hap Sub-District. The lagoon is in Khao Phra Bang Khram Nature Reserve. Upon arrival, you still need to walk through the forest, around 1.5 kilometers from the parking area, to reach the lagoon. The entire 10-minute walk is also nice as you get to see different forest vegetations and the dirt path is also safe. The Crystal Lagoon is big enough to accommodate more than 100 people and it is believed that the warm water has therapeutic properties to improve health. The water isn’t potable because of its high level of calcium carbonate content. The radiant pool is 1.2 meters deep with quite a thick texture, probably because of the high mineral deposits of the water. After dipping in the lagoon, the next nature stop to try is the Klong Thom hot spring which isn’t too far and is still part of the nature park. The best time to visit the pool is definitely in the morning before 11 am because lots of children from school go there at 2-3pm. Before embarking on this nature trip, you need to prepare necessary stuff – that includes a beach towel, swimming outfit and comfortable walking shoes since the pool is more than a kilometer away from the parking area. You should also be careful because the rocks surrounding the pool are slippery due to calcium carbonate. Bringing food and drink isn’t allowed in the park; however, there are restaurants near the pool for you to have lunch. There are many Krabi excursion packages offered by different travel agencies in Ao Nang Beach. Common day trip packages consist of Tiger Cave Temple, Crystal Lagoon, Klong Thom hot springs and elephant trekking. Perhaps, this is the most convenient way to travel around Krabi without the hassle of searching around for these places.